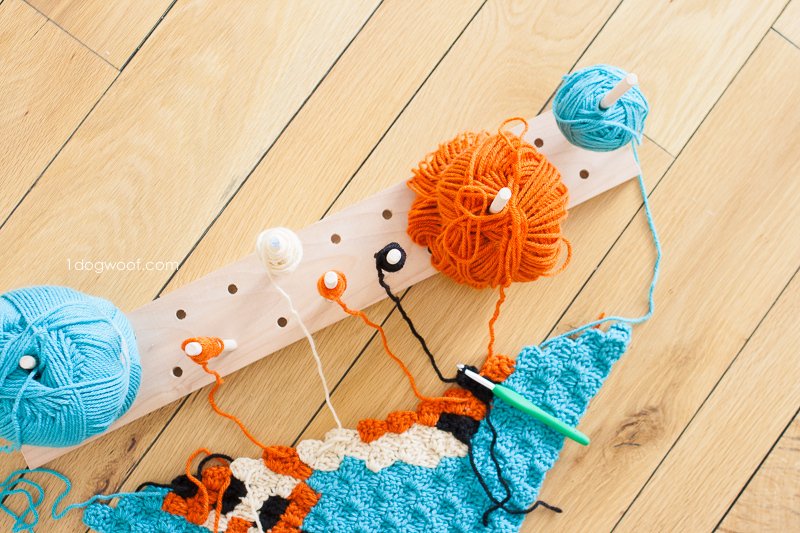 Today, I’m sharing my modular crochet bobbin holder – this is what I use to keep my yarn from getting tangled up while working on a C2C project that requires several active yarns (and colors) at the same time. 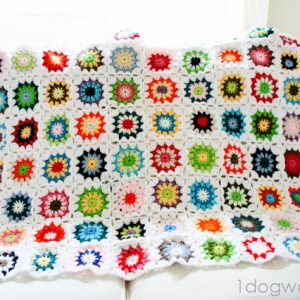 It’s great for C2C projects, but also any large graphghan too. 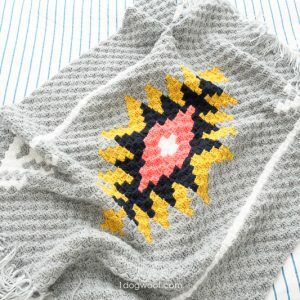 I’ve used it for all my Zoodiacs C2C squares, and best of all, it cost me under $10 to make! I think after making about 2 of my Zoodiacs squares, I was ready to rip my hair out. Why? Because my yarn was EVERYWHERE. Not just all the yarn ends, those are bad enough, but I had several active yarns at the same time, and they kept getting tangled with each other. 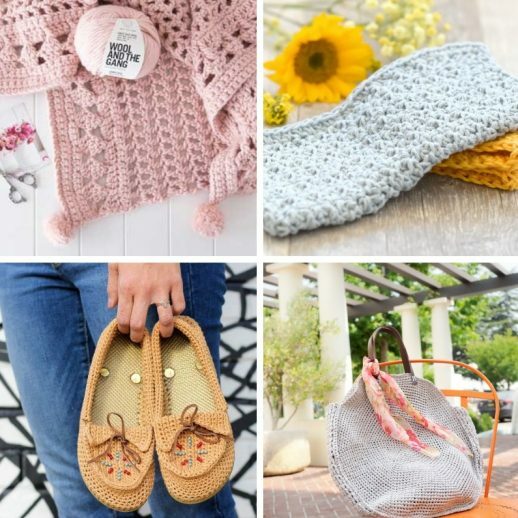 I did a quick search to see how other people kept their yarn from tangling, and saw different contraptions with clothes hangers and clothespins and embroidery floss bobbins. 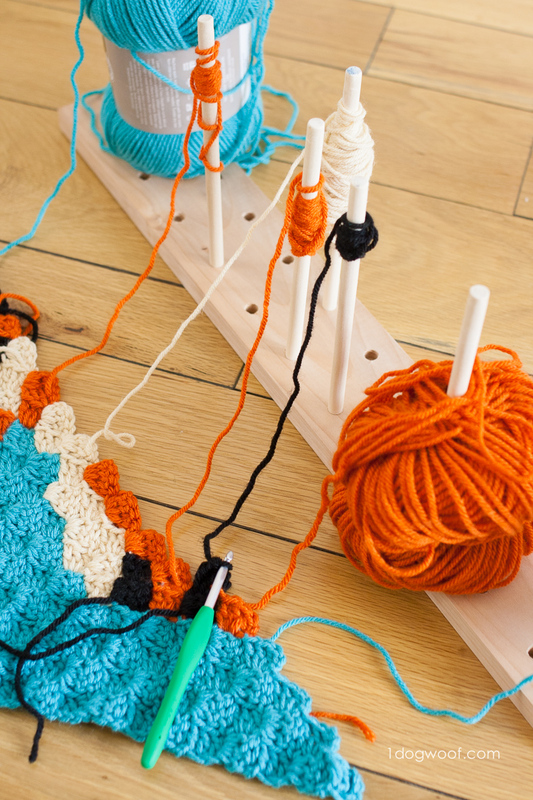 The concept was easy – keep all the yarn wound up until you need it. 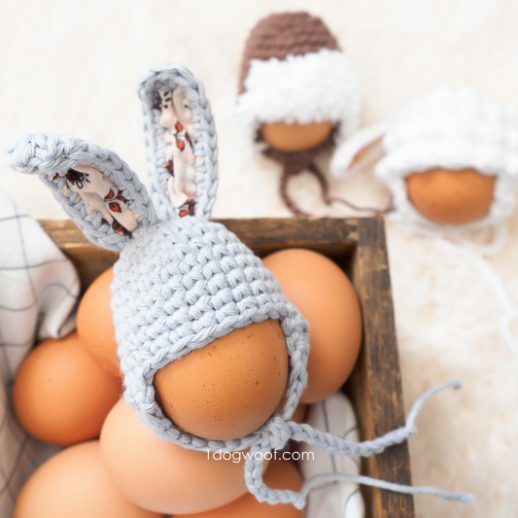 But I didn’t know how much I would need for each Zoodiacs square, and I didn’t want to keep cutting strands to wrap around a clothespin and then run out of yarn only to have to connect more. hold an entire skein, or just a short strand. be small enough to carry around and keep my yarn neat so the husband doesn’t yell at me for stashing my project all over the living room (whatever, he still does it anyways). 1. Start with the dowels. 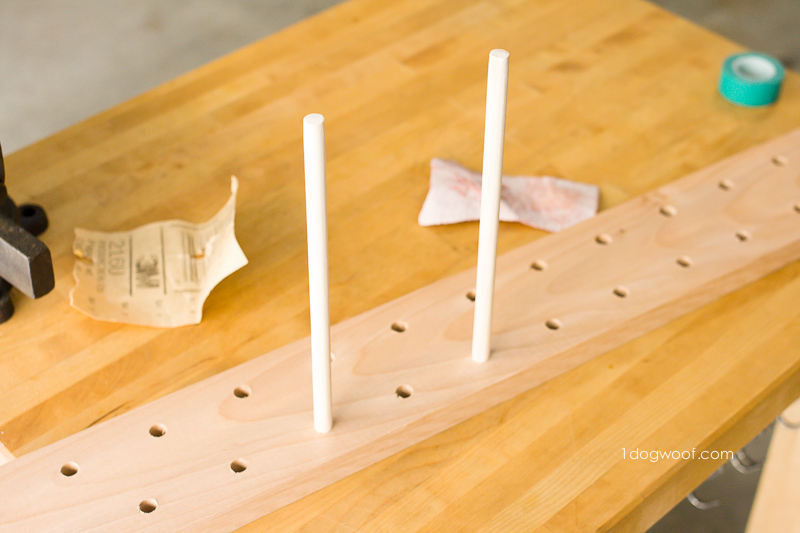 Secure each dowel in a vice or clamp and cut them into 8 inch lengths. That means that a 48″ length of dowel will yield 6 8″ bobbins (give or take a bit on the length). 2. 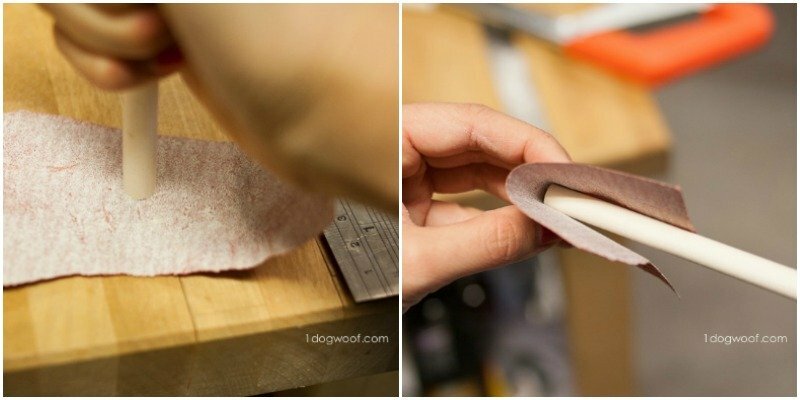 Put a piece of sandpaper on a table, and rub the ends of each dowel on the sandpaper. Then sand down the edges slightly. Wipe them clean. Those are your bobbins! 3. On to the wood board. Home Depot has a large selection of wood precut to different lengths and widths, of all different wood varieties. I like using Cherry or Poplar, as those are much lighter than the hardwoods like Maple or Oak. Heavy is ok, but on the off-chance you have kids that might pick it up and swing it around…..
4. Mark holes in the wood board where you’d like each bobbin. I marked a hole every 2 inches, and staggered them an inch apart on the second row. 6. Clamp down the wood board to your work surface. 7. Drill each hole where marked. 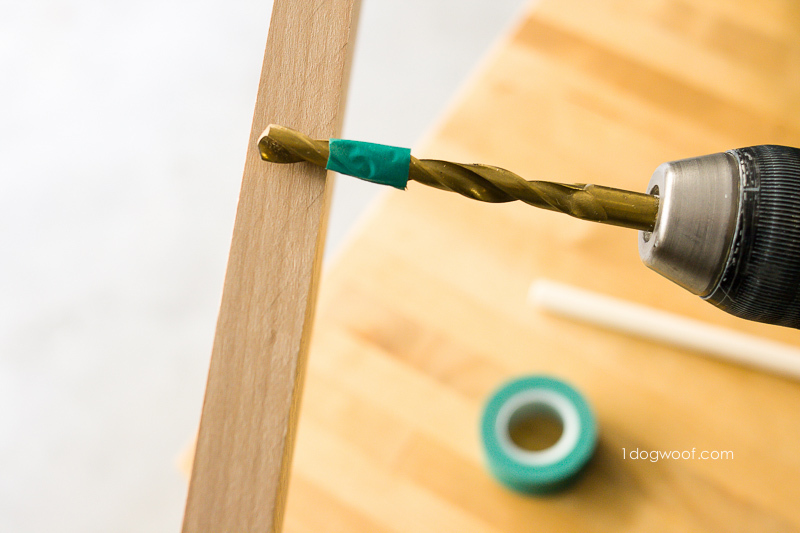 You don’t want to drill all the way through your board, so here’s a tip: line up your drill bit to the approximate depth you want to drill to, and mark it with a piece of tape (washi tape works great!). When you drill, stop when the tape gets to the top of the wood board. 8. Sand down the ends and corners of the wood board. 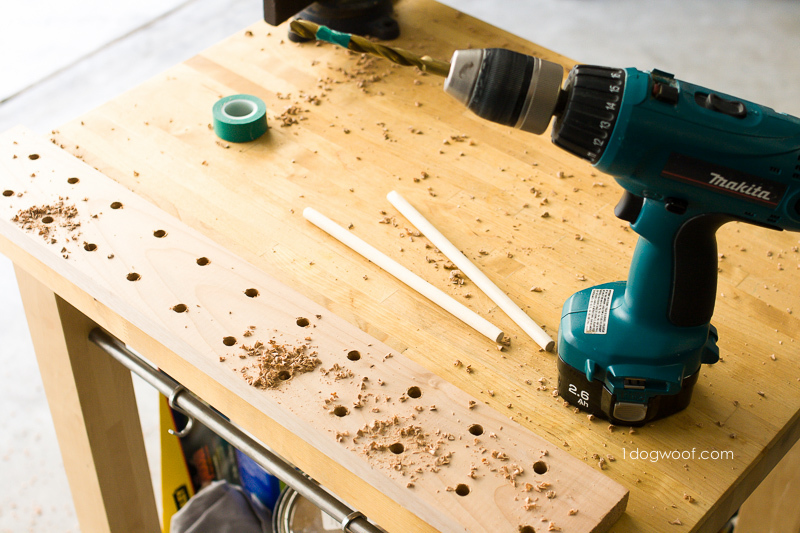 Clean up the sawdust from inside the drill holes. Voila! Now, how to use it…. 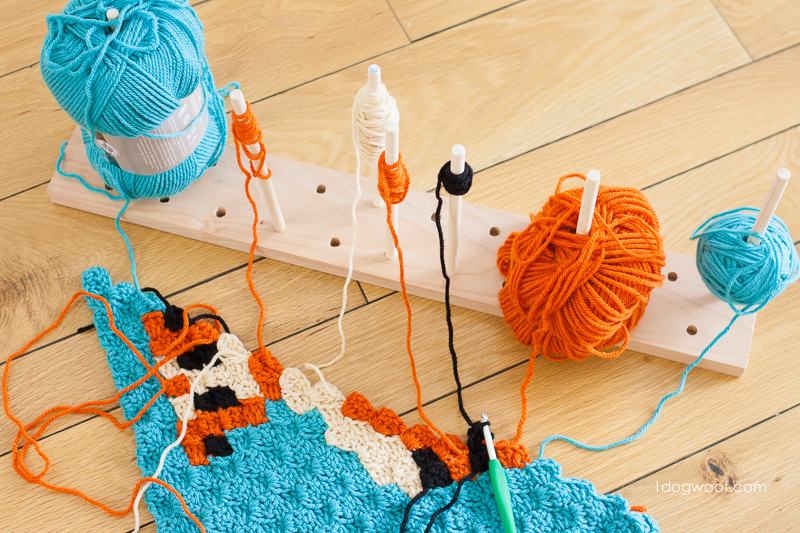 Once your project requires 2 or more yarns/colors simultaneously, it’s time to bust out the bobbin holder. If you have a center-pull skein, awesome. Throw that onto a bobbin and jam it into your wood board somewhere. Don’t worry, you can always change the bobbin position. 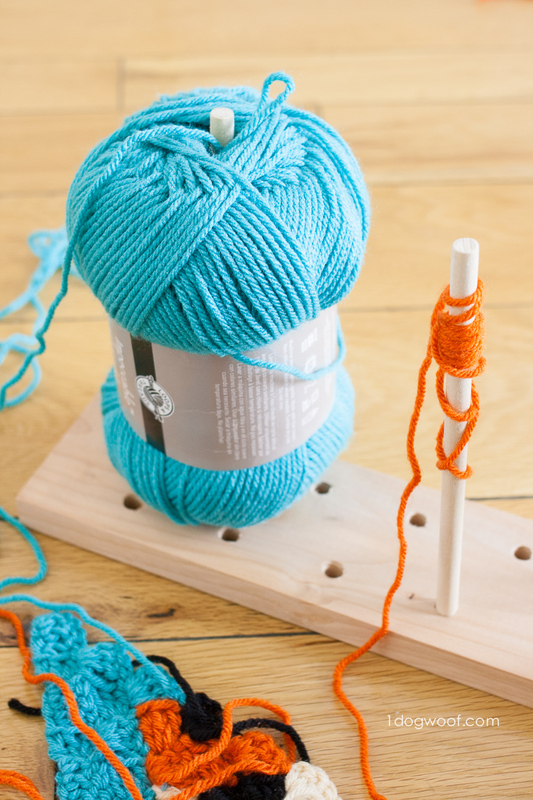 If you are using scrap yarn or a shorter strand of yarn, simply wrap the yarn around the bobbin and place it somewhere on the wood board. You want your bobbins placed in the same order that you’ll be crocheting. If a particular row moves from blue to orange to black to blue, that’s how the bobbins should be arranged. This is also why sometimes it’s nice having two skeins around, so you can work 2 skeins of blue at the same time. 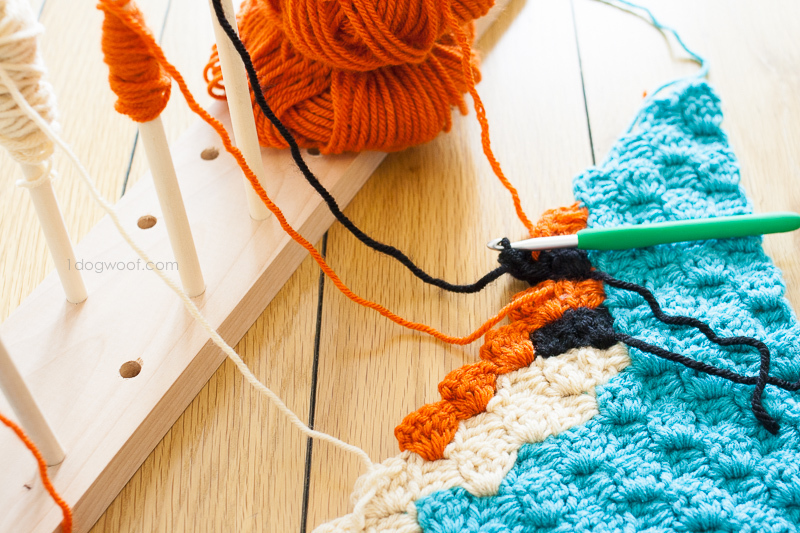 In C2C crochet, you have to turn your work at the end of every row. Now that your bobbins are organized well, you have two choices when you hit the end of a row. You can flip your entire bobbin holder so you’re always working in the same order as what’s on the bobbin holder. You can keep your bobbin holder steady, work one “right” row, flip and work the next row criss-crossed, then flip back to work another “right” row. The key here is to flip (and flip back) in the right direction. But never fear, if you screw up, you can re-adjust all the bobbins! And as a little something extra, I found that my Clover Amour hook also fit into the holes perfectly, so when I needed to stop for the night, my yarn and my hook were all neatly lined up on my modular bobbin holder. Win! Thank you! This is perfect and I’m getting my supplies tomorrow. Unless if my husband wants to pick them up today, I’m at work. Such a great idea! Great idea! Thanks for posting the instructions too. Thank you so much for posting this info. I made my first multi-skein project last month and spent so much time untangling my yarn. Wish I had seen this before I did it. You are so creative and helpful. This is awesome! Thank you so much for the idea! I’ve already made myself a modular blocking board juat like your’s. Can’t wait to make this as well!! I have struggled with this problem for years but never really thought about how to fix it. I have used safety pins to hold small amounts in place, etc. but inevitably they still get tangled. 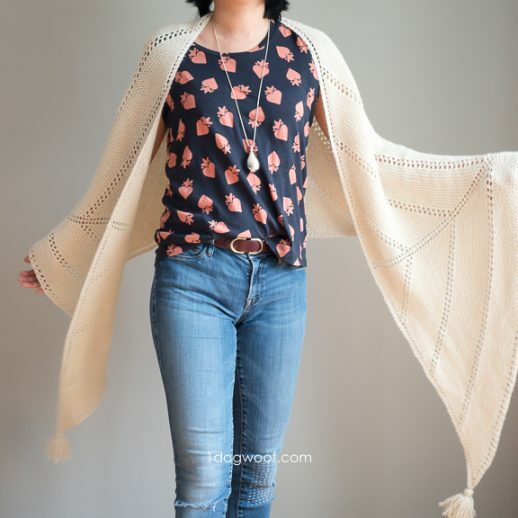 I am going to make this this weekend! Thanks for the tip. Fantastic!! Do not know how I managed to make squares before having this made for me (by my lovely father). Thanks for the directions!! I must be dense. I still don’t see how to keep it untangled when you turn. Do you have a video showing how this works. It will stay untangled while working on one side. Once you turn, the bobbin holder needs to turn with you so all the bobbins stay in the same place, relative to each other. Unfortunately, I do not have a video, sorry! This is such a good idea, ChiWei! 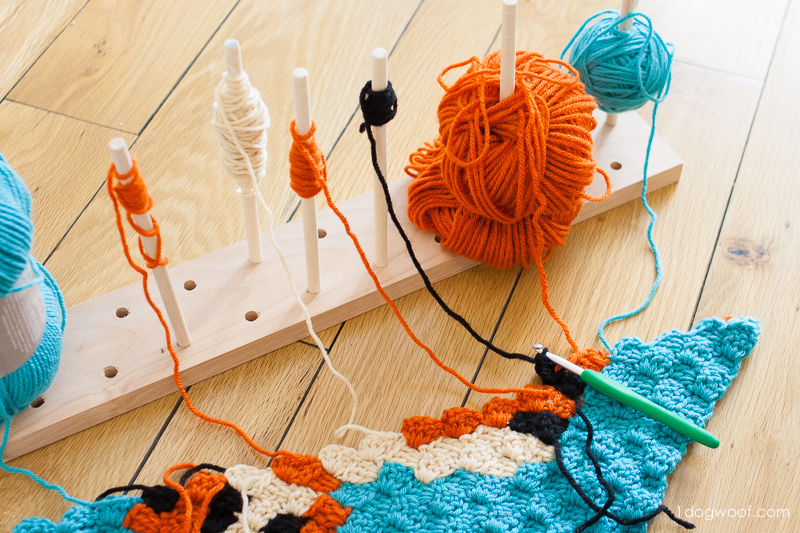 i’m def going to do this as I’m only 4 days into C2C and already have managed to make many large knots in my yarn! my brother made me one and gave it to me yesterday – i am SO excited to get a chance to use it!! This is a fabulous idea! I have just started my first c2c project and was having trouble with the yarn knotting. I showed my husband this and when i got home from work he had all the materials and we made it tonight. Can’t wait to try it now! Thanks again for such a great idea!! I cannot even begin to thank you for this. 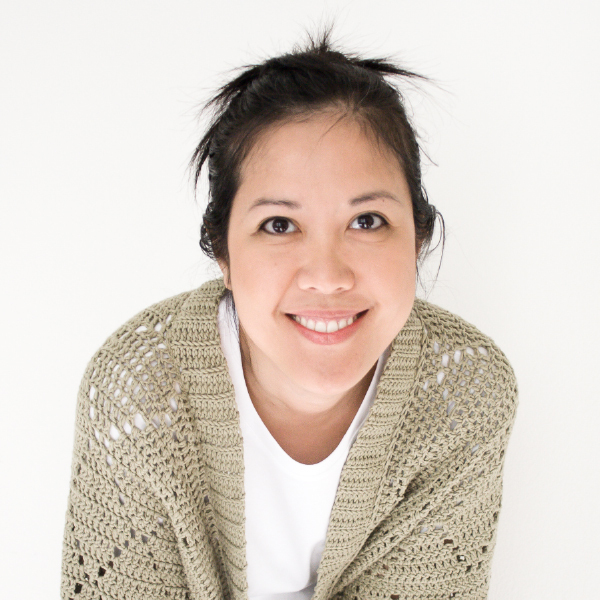 I’ve been knitting and crocheting on a very novice scale for years despite my ability to make great stuff. I’ve always been too intimidated to attempt something that requires this much skill and your instructions made me feel capable for the first time. 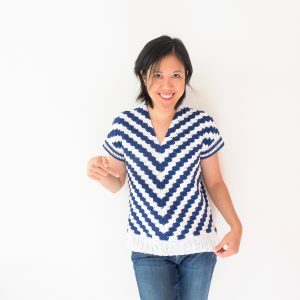 In this community it’s often a little overwhelming trying to read patterns (especially motifs and corner to corners even if you’re fairly confident in intermediate level patterns in knitting – the true test of skill! No tearing out there!!) and I’m admittedly pretty daft when it comes to complex lingo and the “career knitters” can come off as pretty out of my league . I actually feel like I can do the southwestern pattern from lion despite the unknown territory and I cannot even thank you enough. It’s like you get the folks like me that have a true passion but aren’t so good at diagrams and math. Hahah!! You’re an angel!! I’m going to be in the garage drillin’ and gettin my prep game in order. Bobbin and weavin. I subscribed and plan on attempting anything you send! 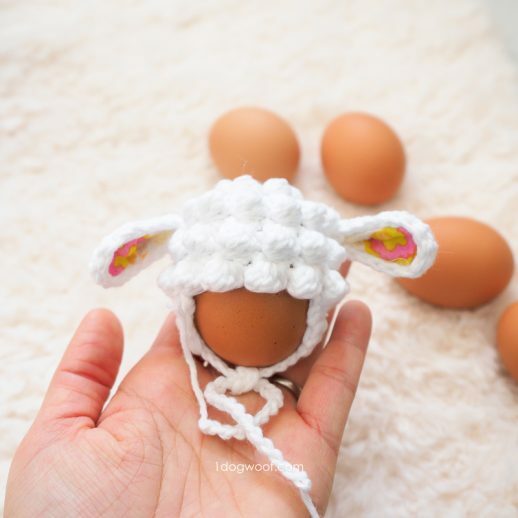 You put newstitchaday to pasture with your attention to detail and laymen’s terms!! No videos needed!! I’m so excited!! !